Hello Hsien Loong this is Angela speaking…. 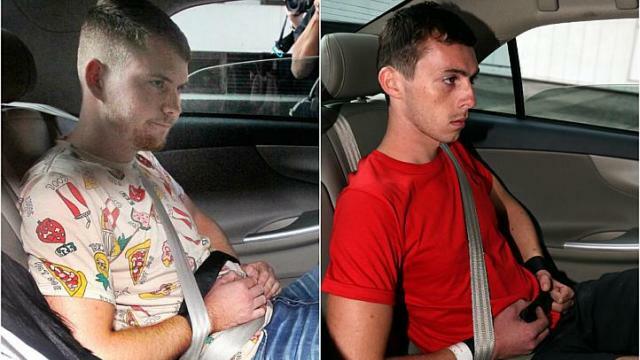 SINGAPORE – The two Germans who vandalised an MRT train have been sentenced to nine months’ jail and three strokes of the cane each. The jail term was backdated to Nov 22, 2014, when they were remanded. Andreas Von Knorre, 22, and Elton Hinz, 21, were charged with entering Bishan SMRT depot, a protected place, without authorisation three times in the wee hours of Nov 6, 7 and 8 last year. On Nov 8, they used indelible spray paint to spray graffiti on an SMRT train at the depot along Ang Mo Kio Avenue 1 between 2.48am and 3.29am on Nov 8. On March 4, the two men, who were represented by lawyer Christopher Bridges, pleaded guilty to two charges of entering the protected place on Nov 7 and 8, and spraying graffiti on the train carriage on Nov 8. The other trespass charge on Nov 6 was taken into consideration. The pair, who were working in Australia, had arrived in Singapore on Nov 4 and stayed at a hotel in Geylang. That day, they bought 12 cans of spray paint from Art Friend in Clementi. They went to a supermarket to buy yellow latex gloves. The court heard that the duo entered the SMRT premises via a drainage system on Nov 6. They went there again over the next two days and committed vandalism on Nov 8. SMRT suffered damage of about $13,650. The two men are believed to have left the country after that. They were later located in Bangkok by the Thai police. Malaysia police arrested the pair at the Kuala Lumpur International Airport on Nov 20 and they were extradited to Singapore the next day. “They deserved their backsides to be caned,” said Rosli Moorabi, 34 a tattoo artist.